I’ve got a few good pancake recipes to work with now: praline ricotta, sweet potato, banana with hazelnut mascarpone cream, to name a few. They taste great, but those recipes all require special ingredients or extra steps, and sometimes I just want to get the food on the table without the fuss. 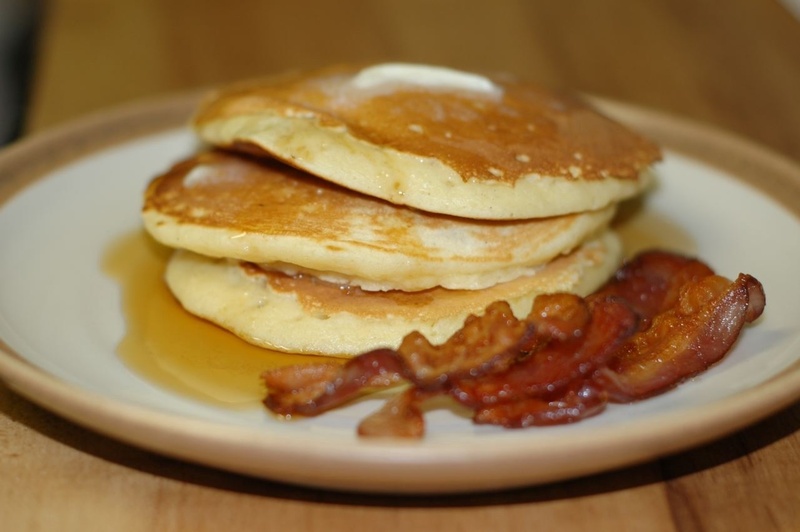 Here are my two basic pancake recipes for those occasions. First up is a recipe from the King Arthur Flour Baker’s Companion; yes, the same book I was complaining about just the other day. But my gripe is with the inconsistency of the recipes: some need much more baking time, some need adjustments to their ingredients, and some are perfect just as they are. This pancake recipe is the very first one in the book, and it’s a keeper, especially if you have a stand mixer. It makes gorgeous, fluffy pancakes with the most basic pantry ingredients. One day I’ll remember to put some malted milk powder in the cart and try that version. Beat the eggs, milk, and vanilla until light and foamy, about 3 minutes at high speed of a stand or hand mixer. Stir in butter. Whisk the dry ingredients together, and gently but quickly stir into the egg and milk mixture. Let the batter relax while the griddle is heating (or overnight in refrigerator). The batter will thicken slightly while resting. Grease and preheat griddle. Drop ¼ cupfuls of batter on the lightly greased griddle, and cook on one side until bubbles begin to form and break (this is the time to add anything like berries, chocolate chips, etc), then turn the pancakes and cook the other side until brown (turning only once). Source: The King Arthur Flour Baker’s Companion. My other pancake recipe is a more recent addition to the hit parade, even though I first tried it out several years ago. It comes from the Good Enough to Eat Cookbook, so of course I made a batch almost as soon as we came back from New York—with limited success. They really just didn’t taste anything like the ones at the actual restaurant, which was a big disappointment for us. A few months ago, however, I got tired of making the perfect pancakes above, and decided to take another stab at the 4-grain pancakes. This time I subbed buckwheat flour in for the cornmeal, knowing Jeremy’s aversion to the latter. 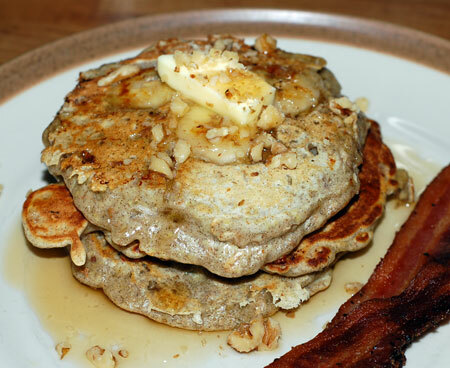 Well, I can’t say that they taste like the ones in New York City, but the buckwheat made a huge difference in taste for us, and the fact that they are multi-grain gives us one more excuse to eat breakfast for dinner. We usually have some extras to keep in the fridge, and Nolan likes them smeared with peanut butter and jelly. Mix together the dry ingredients in a large bowl. Measure out the milk and buttermilk in a large measuring cup, add the eggs and whisk thoroughly. Quickly stir the liquids into the dry ingredients, then the melted butter, stirring just until combined. Allow the batter to rest while you heat up the griddle, slice fruit, chop nuts, start some bacon cooking, etc. I use a quarter-cup scoop for our pancakes and sometimes press thin slices of apple or banana into the batter on the griddle. This time I used bananas and added some walnuts too. Source: The Good Enough to Eat Breakfast Cookbook.